“If you do wrong, be afraid, for [the one who is in authority] does not bear the sword in vain. For he is the servant of God, an avenger who carries out God's wrath on the wrongdoer” (Rom 13:4). Speaking in favour of this motion was my area Member of Parliament, Hon Given Lubinda. I was opposing it. Before I give a summary of my argument in favour of the death penalty, let me state that when I saw the program, it was clear to me that the forum was biased in its composition. Clustered across the room were emotive posters supposedly of a dead person’s neck with signs of stitching after undergoing the death penalty. The event itself took about four and a half hours. 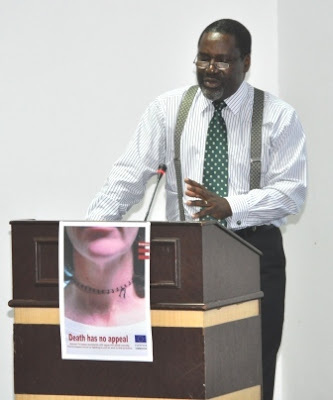 The first speaker was His Excellency Derek Fee, an ambassador and delegation head of the European Union in Zambia. 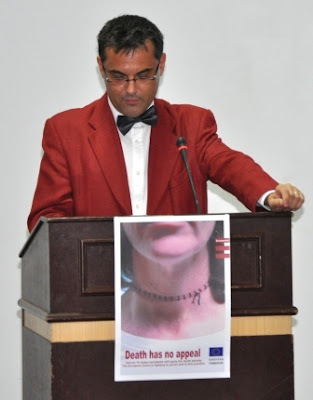 The second speaker was a Member of Parliament from Italy, Hon Marco Perduca, who was also a member of an organisation called Hands Off Cain. 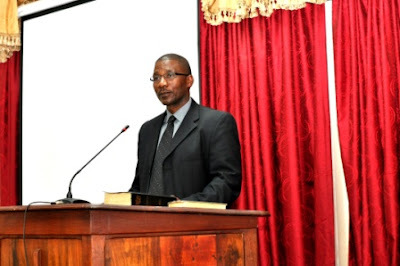 The third speaker was a lawyer, Mr Abraham Mwansa. The fourth speaker was also a Member of Parliament from Italy, Hon Elisabetta Zamparutti, who was also a member of Hands Off Cain. After the debate, the final speaker was the French Ambassador to Zambia, His Excellency Olivier Richard. 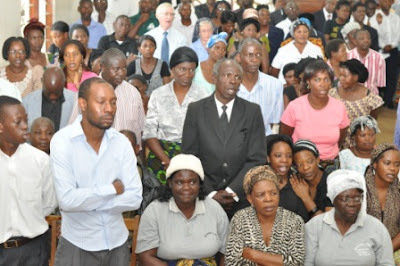 These together took up about two and a half hours and they all spoke against the death penalty (although Mr Mwansa spoke against its mandatory nature rather than against the death penalty per se). 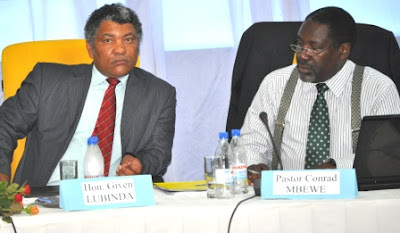 Add to their voices that of Hon Given Lubinda, then you can see why my 15 minutes was just a drop in an ocean. The whole event was tailor-made to tilt in the direction of abolition. Ladies and gentlemen, God must have a sense of humour. Although my area Member of Parliament has visited my church at least once, we have never met until today. I would not have chosen our first meeting to be in an arena where we have locked horns over the subject of the death penalty. My one comfort, however, is that this is happening in a place where none of us has any home-ground advantage! I want to assure the MP that whatever the outcome of this debate, I remain his loyal subject. When I accepted to come and speak at this event, it was before I saw the program. 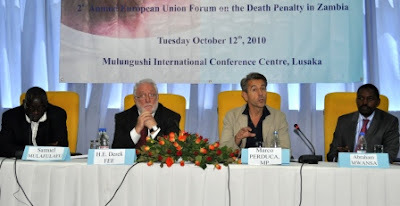 When I finally had occasion to see the program, I said to myself, “Conrad, what have you done?” The organisers have certainly marshalled together a formidable team to oppose the death penalty. If I had seen all these “excellencies” and “honourables” much earlier, I probably would have chickened out. But now I must proceed. It must come as a surprise to many of you that I, a man of the cloth, should be the one opposing the motion that “The death penalty constitutes a cruel and unusual punishment and has no place in a civilised society.” Therefore, let me say this. I love all human beings—including alleged, convicted and real murderers. My own church participates actively in reaching out to prisons with the gospel of Christ’s love, including Mukobeko Maximum Prison. 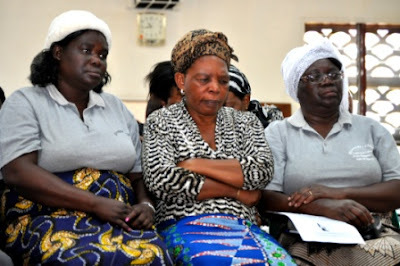 In fact, a number of prisoners who were on death-row and were pardoned by President Mwanawasa just before he died are my personal friends. I first met them while visiting Mukobeko. Let me also state that I am in favour of the President’s Prerogative of Mercy as it stands in our statute books, and so am grateful that some of these friends of mine who truly reformed while in prison were its beneficiaries. Having said all this, I insist that the death penalty should remain in our penal code for the reasons I will now go on to explain. The remedial view of punishment: This view asserts that punishment is supposed to be curative. If you kill the offender you are not helping him to become a better person. The deterrent view of punishment: This view asserts that punishment is supposed to deter other would-be offenders. Statistics prove, we are told, that the death penalty does not have this effect. The right to life: This view asserts that every human being—even a murderer—has an inalienable right to life. No one—not even the state—has the right to take his life away. Two wrongs don’t make a right: This view asserts that taking away anyone’s life is always wrong. The fact that a murderer took someone's life does not justify the state doing the same thing. The fallibility of human judgment: This view asserts that there have been instances when a judgment has been overturned by evidence found later. In the case where the punishment was death, it is too late to reverse it. An innocent life is lost because of an error in court. The sanctity of life: This view asserts that only God can give life and only God has the right to take it away. Anyone who kills is invading a sphere where only God has prerogative. The need to turn the other cheek: This view asserts that the Bible commands us to leave revenge to God and instead turn the other cheek when we are wronged. The death penalty goes against this command in the Bible. I argue against all these seven assertions because (1) They give a false view of the basis of punishment, and (2) They give an equally false view of the basis for the death penalty. The basis of punishment is not how successful it will be in rehabilitating the offender but rather whether it is fair with respect to the crime committed. In other words, the basis of punishment is justice. In the domestic sphere, our punishment is really a form of corrective discipline. The parents’ chief interest is not justice but the positive changing of the character of the child. But that is not the job of the judiciary. The work of the judge is to ensure a correct interpretation of the laws enacted by the legislative arm of government, to acquit the innocent (i.e. those who continue to obey the laws), and to prescribe fair punishment on those who break those laws. Thankfully, fairness is not a preserve of those with university degrees in law. Even a child has an inborn sense of justice. Many times when a parent or teacher has made a decision that has disadvantaged a child beyond what he or she deserves, you will hear the child cry, “It’s not fair!” Who taught that child the concept of fairness? We are all born with it. So, when you hear a statement like, “An eye for an eye, a tooth for a tooth, a foot for a foot, a hand for a hand, a burn for a burn, a wound for a wound, a bruise for a bruise, and a life for a life,” your heart responds, “Yes, that is only fair!” Anything less would favour the assailant, and anything more would favour the person assailed. Perhaps this is the best place to address the question of cruelty. Every punishment is cruel. If you fine a person, you are taking away his property which he has earned after toiling for many years. Is that not cruel? When you imprison a person, you are taking him away for many years from his friends and family and locking him in an overcrowded little room where he is most likely going to get TB, HIV, etc. I ask; is that not being cruel? To remove cruelty from punishment is to remove punishment altogether. 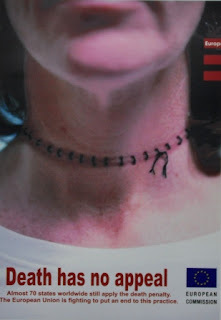 Rather, the cruelty a person experiences must be equal to the crime committed. That is only fair. What about the question of fallibility? Let us use this argument in the context of road and air transport. More people get killed in one country through human error on the roads than through the death penalty across the whole globe. (Also, one error in air transport results in the loss of hundreds of lives). Yet, I have never heard any human rights activists arguing for the abolition of road (and air) transport because of the possibility of human error. All I am asking is that we should be consistent. In the case of the transport sector we are doing everything possible to reduce the possibility of human error. Shouldn’t we be doing the same in the judicial sector also? So, then, as I close, let me ask each one of you a question: “On the basis of justice and fairness, what punishment should be meted out on a person who selfishly, wilfully, and maliciously murders an innocent person?” I do not need to hear your answer. Your consciences and gut feelings have given you the answer, and I know what it is. I rest my case. Thank you! Let me state in closing this blog that, judging from the applause I got from the audience when I finished, I know what the answer to my final question was. The death penalty! I tried to avoid using the Bible in case during the question and answer session that followed the debate, someone would use the argument that this was not a matter limited to Christians. However, I kept being asked, “God says, ‘Vengeance is mine,’ so why are you still insisting that the state should inflict the death penalty on convicted murderers?” So, I finally answered this question. The statement “Vengeance is mine, I will repay” is found at the end of Romans 12. At the beginning of Romans 13 (see text at the top of this blog), God tells us how he will carry out that vengeance. He says he will do it through the judicial arm of the state! “I appeal to you therefore, brothers, by the mercies of God, to present your bodies as a living sacrifice, holy and acceptable to God, which is your spiritual worship” (Romans 12:1). 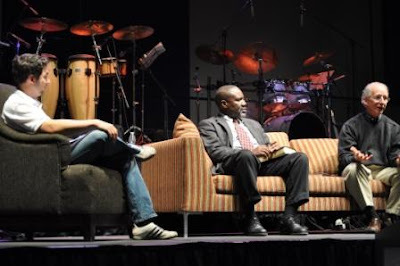 Felistas and I returned last night from South Africa where I was preaching with John Piper at the 2010 Rezolution Conference. 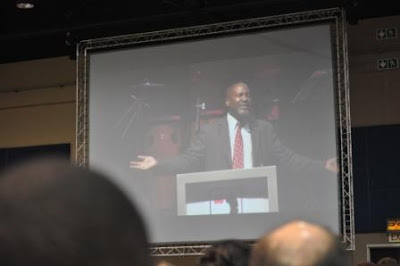 In my last blog, I reported on the Piper 2 Pastors Conference which was held in Pretoria on Thursday 14th. 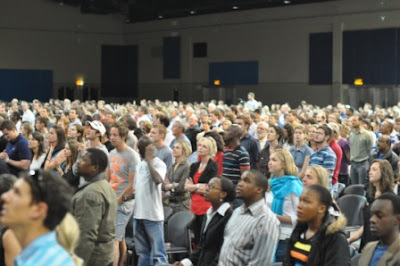 Friday to Sunday was taken up with the Rezolution Conference itself at the Sandton Convention Centre in Johannesburg. Here is a brief report. On this first day, the conference was only in the evening. Whereas the organizers had earlier anticipated some 5,000 individuals in attendance, there was an estimated 2,500 in attendance. 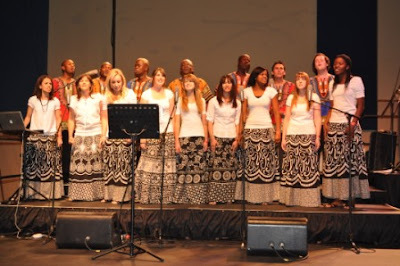 We were led in the singing by a special Rezolution Conference choir, dressed in African attire. They came together solely for the purpose of leading the singing during this conference and often combined the English lyrics with vernacular ones. 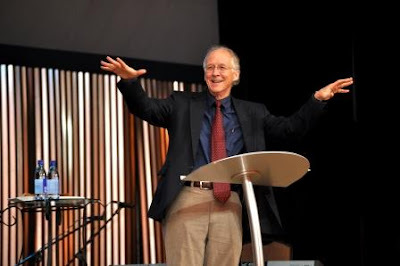 John Piper preached on “God’s zeal for God, God’s love for God.” He showed from Scripture after Scripture that God’s chief end is his own glory. He went from creation, to the call of Abraham, the exodus of the people of Israel from Egypt, their pilgrimage through the wilderness, their invasion of the Promised Land, their being sent into captivity and their return to the Promised Land, and even the coming of the Son of God into the world. It was all for the glory of God and “for his name’s sake!” He ended his evening’s message, therefore, by imploring us to check our spirituality by whether we too are God-centred. God ought to be our precious treasure! This was a full day. 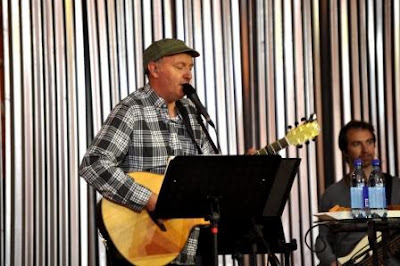 It started with Stuart Townend with his men leading us in singing. We sang a number of older songs (e.g. “Oh, for a thousand tongues to sing) and some new ones—the latter were almost all written by him. No tears this time! 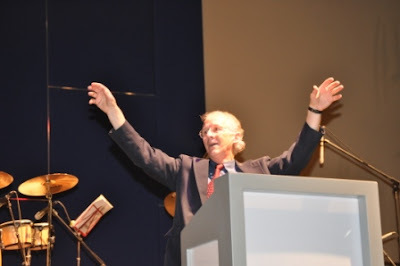 John Piper preached his second sermon. This one was on his favourite theme: “God is most glorified in you when you are most satisfied in him.” If you have never heard Piper preach on this theme, welcome to planet earth! I last heard John preaching on this theme in 1998 when we preached together at a Banner of Truth conference in the UK. He has sharpened his arguments even more since then. Piper argued his case primarily from Philippians 1:20. Then he buttressed his argument with various texts of Scripture that teach and command Christians to find their joy in God. After break, I came on and preached my first sermon. It was on Romans 12:1 and the subject was, “The benevolent basis of Christian Resolve.” The sermon was basically an overview of Romans 1-11. I began by painting the miserable state in which the gospel finds us—enslaved to sin and under the wrath of God. I then went on to show the justifying fruit of Christ’s death, the sanctifying work of the Holy Spirit, and the electing grace of God the Father. I ended by showing from these same chapters of Romans that all this is for God’s glory, and we are destined to share in that glory! This is the mercy that God has had on us, which should be the basis of our commitment to him. 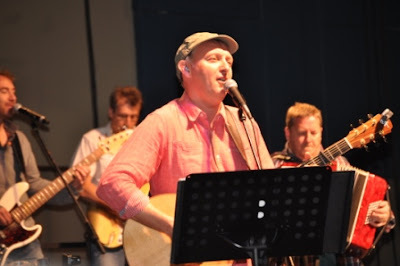 After lunch, Stuart Townend and his band returned to lead us in more of his “all time greats”. After that I mounted the pulpit and preached my second sermon. It was still on Romans 12:1 but the subject this time was, “The Logical Nature of Christian Resolve.” You do not need to be a genius to guess that it was based on the second half of the text, which says, “…to present your bodies as a living sacrifice, holy and acceptable to God, which is your spiritual worship.” I argued that before you can obey God in the specific challenges that come your way day by day, as displayed in the rest of the book of Romans, you must resolve to surrender your whole life to God. It is only reasonable! The last session in the day, after supper, was a Question and Answer session. Our moderator, Tyrell Haag, had spent much of the afternoon compiling the questions that came in through tweeter, facebook, and a drop-in box at the back of the hall. The questions included ecclesiastical matters such as tithing, how we spend a typical day, the danger of those of us who are perceived to be very gifted discouraging those with “lesser” gifts, dating, etc. Knowing how tricky Q&A sessions can be, John and I had prayed for divine wisdom in answering these questions, and it seems that the Lord was pleased to answer our prayers. We were of one mind as we answered them as best as we could from Scripture. This was the last day, and we only had a morning session. 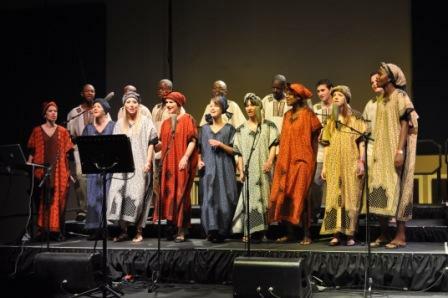 It began with the Rezolution Choir, who were once again dressed in beautiful African attire. 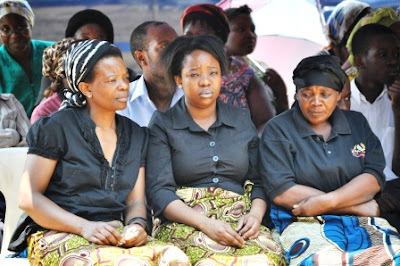 They led us in singing a mixture of ancient and modern hymns and songs, with some Zulu fitted in at appropriate points. Finally, John Piper came forward to preach his final message. “You exist to spread a passion for the supremacy of God in all things for the joy of all peoples.” That was his final sermon, the essence of which was that when we love God and find our satisfaction in him, then we will truly love people because we will want to introduce them to this God who has so satisfied us that we want nothing outside of him. He used 2 Corinthians 8:1-7 to prove his point. He then took us through some pivotal passages in Hebrews to show how persecuted Christians, including our Saviour, were willing to sacrifice, suffer, and die because of a sense of hope that filled them with joy in the midst of affliction. As a result of their suffering, many were enriched unto eternal life. 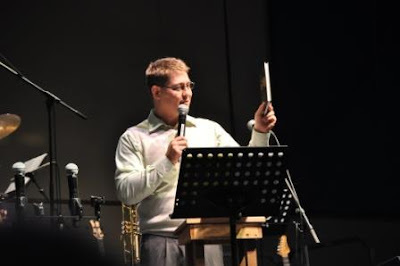 This was the final message of Rezolution 2010! All these messages are available in full on the Rezolution 2010 Website. Just click here! Before I end this brief report on the conference, one item that I must commend the conference organizers for was their book reviews at the start of each session. 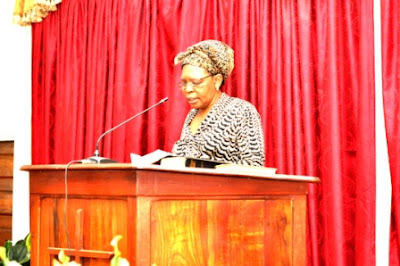 At least three books were commended to the attendees by those who were introducing the sessions before handing over to the person or group leading the worship. There is no doubt that this introduction helps those who are new to the world of Christian books to know which books to go for as soon as the session comes to an end. Augustine Bookroom provided a good array of books, most of which were by John Piper. My only title published outside Zambia, Maintaining Sexual Purity (In a Sexually Permissive Society), was also available. Not bad! "And I, when I came to you, brothers, did not come proclaiming to you the testimony of God with lofty speech or wisdom. For I decided to know nothing among you except Jesus Christ and him crucified" (1 Corinthians 2:1-2). 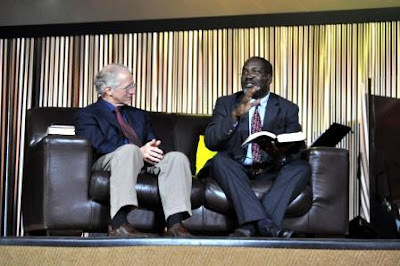 Yesterday, I joined John Piper and Stuart Townend at the Piper2Pastors Conference in Pretoria, South Africa. Below is a brief report on how the conference went. John Piper came on. He began by a quick exposition of the mission statement of his church: “We exist to spread a passion for the supremacy of God for the joy of all peoples through Jesus Christ.” This was a statement he constructed after the most difficult time they ever had a church. Piper then shared from his morning devotional reading. He took us to Jeremiah 24:5-7. God regarded the Jews returning from exile as good…then after that he gave them a heart to know him. He made the point that God in election chooses to regard us as good in Christ, and then pursues us to make us truly good. John ended his sermon with four implications for our people, pastoral work, preaching and wider work. (a) We should tell and model for our people that this is their vocation—to pursue all their joy in God. The Bible commands that we rejoice in God, the Bible threatens terrible things if we do not do so, etc. (b) If you are indifferent to your pursuit of joy in ministry then you are indifferent to your people’s benefit from your ministry (Hebrews 13:17). We must be sorrowful, yet always rejoicing (2 Cor 6:10). (c) We must work for the joy of our people (2 Cor 1:24). (d) The error of intellectualism, dead orthodoxy, and anti-intellectualism are due to a failure of getting emotions and affections in the right place. When right doing is not invested with right affections it results in legalism and antinomianism results when we want joy without right doing. I preached my one sermon for this conference. 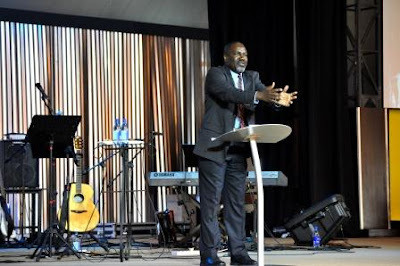 I preached on a Christ-centred ministry, based on the Apostle Paul’s assertion to the Corinthians in 1 Corinthians 2:2 that when he went there to plant the Christian church he did so with a resolve to know nothing but Christ and him crucified. After lunch, we had a question and answer. Tim Cantrell moderated this session while John and I answered the questions. Almost all the questions were really on John Piper’s sermon because his message was more controversial than mine. Those who have listened to John will realise that he tends to state Reformed truth but in a way that makes people sit at the edge of their seats. He did the same on this occasion. You may not always totally agree with him but he gives you food for thought. 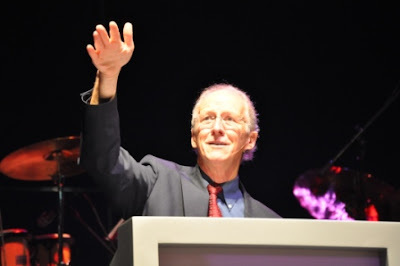 After the Q&A, John Piper came on with his second message. In this sermon, he argued that right thinking about God is what produces right feelings for God. The devil knows more doctrine than all of us, but his feelings are all wrong. He hates God! Rom 10:1-2 talks about Jews who have passion and zeal for God but it is not according to knowledge. 2 Tim 2:7 has two parts which are complementary. The ground that our thinking will get anywhere is because the Lord gives understanding. He has ordained that understanding will follow hard thinking. Acts 17:2-3 Paul reasoned, explained and proved the gospel; we must do the same. Jesus assumed that we would use logic in natural circumstances and urges us to do the same in the spiritual world (Luke 12:54-57). Matthew 21:23-27 Jesus loves the open statement of the truth and not weaselling around the truth (2 Corinthians 4:2-4). “Do you not know?” is a popular question of Paul. This is often in a context of obvious logical deduction. This is because knowing things will make you behave in a particular way. The Bible tells us that Christ has given pastor-teachers to the church (Eph 4:11ff) because God has ordained that sheep get understanding from shepherds. The Bible tells us in Acts 20:27 to declare the whole counsel of God. This is the deposit of truth that was left by Paul and the church elders must take it and pass it on to their people. The Bible is a book. Wherever the church has sprung up, schools and hospitals. Schools are there because God almighty has ordained that his Son, the Word, became flesh should be preserved in a book. So, thinking is required to read (see Eph 3:4). Examples of reading and thinking that yield joy and love. Psalm 100 clearly shows that in order to be joyful in God you need to “know” certain things about God. You need theological underpinnings if you are going to have God-glorifying joy. Matt 7:7-12 shows that although God will not always give us what we want he will always give us what is best for us. You need to THINK in order to appreciate the “therefore” or “so” in verse 12. The answer is that you are inspired to do to others what you would have them do for you because you know that your Father in heaven will take good care of you. The whole conference ended with Stuart Townend leading us in singing the modern classic “In Christ Alone”, which he also composed. There could not have been a better way to end the day’s conference! “Seek first the kingdom of God and his righteousness and all these things will be added to you” (Matthew 6:33). Several years ago, the elders at Kabwata Baptist Church saw a growing need to give focused instruction to the growing middle-to-upper class individuals within the membership of the church. Once upon a time, KBC comprised largely college and university students. These had since graduated and began going up the career ladders in their different professions. Some were now in top management, while others had begun to branch off into their own businesses. There was need to help this group to continue being salt and light in the world instead of being sucked into the rat race that makes up the lives of so many who are in their ranks. Most of them were first generation Christians and so did not have role-models that they could look up to. There was a need to look outside our immediate circles to find those who can say “follow my example, as I follow the example of Christ” (1 Corinthians 11:1). We realized that the solution for now was to have a bi-annual one-day Christian business seminar, which would work towards giving our growing middle-to-upper class such instruction. 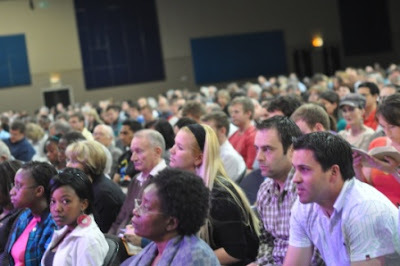 We were mindful that there were already some seminars earmarked for Christian business people. However, whereas almost all of these seminars were of a Charismatic nature and were preoccupied with how such people could be more wealthy, our goal was on helping our people to “seek first the kingdom of God and his righteousness and all these things will be added to [them]” (Matthew 6:33). As Reformed Christians, we are zealous for the glory of God. Therefore, there is need for our people to translate this zeal into the realm of professional and business life. The biggest task was to find good role models for these men and women in professional and business life. Thankfully, over the years the Lord has brought into my path a few men who are in the world of business and who exemplify something of what I would like to see in the first fruits of our Reformed Christian professionals and business people. 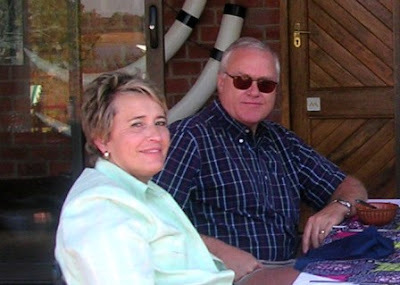 Thus in 2006 we held our first conference at the Cresta Golf View Hotel, with Nico van der Merwe as our speaker. Nico trained as a pharmacist and is the founder of the H.A.S.S. Group of companies in South Africa. His enthusiasm for the Lord’s work even as a businessman almost puts my own to shame. I mean it! I will say a little more about him in a future blog when I do a book review on the book that he has recently written, What Does God Know About Business? This book, which is hot-off the press, will be available at a special conference discounted priced at this weekend’s seminar. 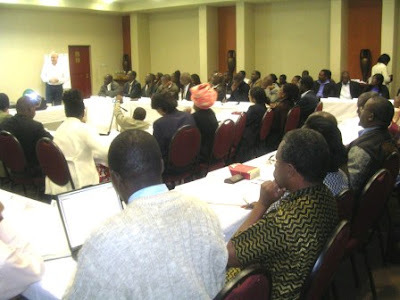 In 2008, we held our second conference at the Dream Valley Lodge, with Dr John Temple as our speaker. John trained as an electrical engineer right up to PhD level and ran his own very successful business for many years. He then retired from business and, together with his wife Yvonne, left South Africa to settle in the UK so that they could be more accessible to their children and grandchildren. He still has business interests that literally span the globe. He has written a book entitled Be Successful, Be Spiritual. Again, I hope to write a review on this book soon. 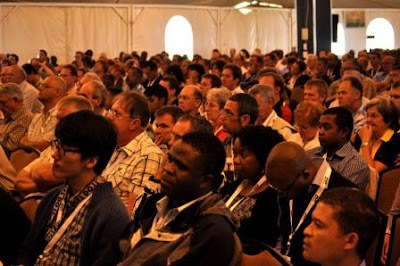 This year (2010), we are holding our third conference at the same venue (Dream Valley Lodge). It will be held this coming Saturday, 9th October, and the speaker will be Musa Phiri. Musa is a Zambian businessman stationed in South Africa. He runs his own architectural firm, PG Architects. 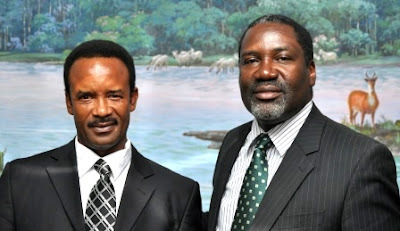 Soon after his conversion while he was still in high school some thirty years ago, he was baptized at Lusaka Baptist Church by Pastor Joe Simfukwe. He went on to study Architecture at what is now called the Copperbelt University before emigrating to Botswana and later to South Africa. If you are involved in professional or business life and able to make your way to Lusaka this weekend, I have no doubt that you will benefit immensely from the ministry of Musa Phiri. I have known him since he was born—literally—and can vouch for him that the grace of God has worked powerfully in his life. If all Christians went about their professional and business lives like he does, we would not only have a better church but also a better world! Details concerning this one-day conference are available from the Evergreen Christian Bookstore. Call either +260 211 260 154 or +260 955 330 033 and ask to speak to Kakonde Simbeye, the bookstore manager. I am aware that space is limited and can only hope that there may still be room for you! “The path of the righteous is like the light of dawn, which shines brighter and brighter until full day” (Proverbs 4:18). 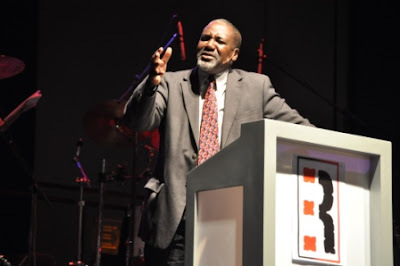 I was driving to Kitwe last Friday to preach at the Riverside Faith Baptist Church’s Annual Bible Conference over the weekend when my phone rang. 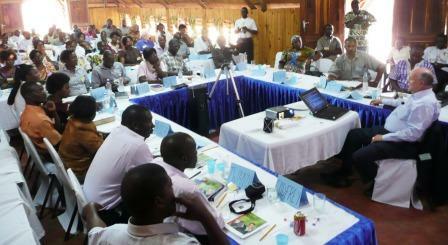 It was Mrs Womba Sakanya, the vice chair of the Norfred House Hotel in Kitwe. She gave me the bad news that John Musonda, the board chairman, had gone to glory that morning. As phone calls began to come in, one after the other, I knew that this was no mistake: Ba John was gone! My personal dealings with John Musonda in the recent past were in the context of the Zambia Young Men’s Christian Association (YMCA). While serving as national president, one of the greatest challenges I faced last year was to replace the board of the Norfred House Hotel in Kitwe. This hotel belongs to the YMCA and financially sustains the operations of the national office. It was going through troubled waters. I asked a friend to recommend some outstanding Christian businessmen and women whom I could appoint to this task, and the very first name he gave me was that of John. The nature of the YMCA is that it is a volunteer organisation and so there are no allowances for serving on this board. This did not discourage John and he threw his weight into the work. I supervised the elections at the very first full board meeting and his fellow board members chose him as board chairman. So, for the last one year, we have worked very closely together to begin the mammoth task of turning the hotel around both in terms of its business and its reputation as a hotel run by a Christian organisation. Those who live in Kitwe will understand what I mean by this. 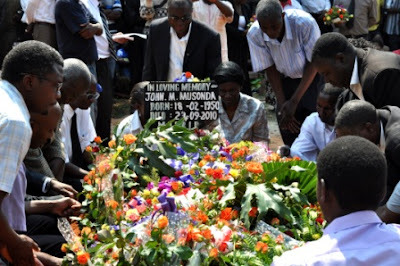 John Musonda’s funeral service took place last Monday at the Riverside Chapel in Kitwe. As you may well imagine, there were more people outside the church building than inside simply because the crowd was far too large to be accommodated inside. 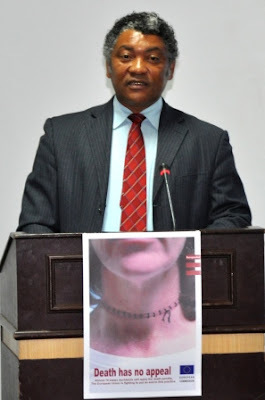 John Musonda was the General Manager of Chloride Zambia. I was rather amused when I discovered who was giving a speech on behalf of the company. It was Mr Ndabambi. About one year ago, I had an early morning flight to South Africa and sat next to him. One of us was having his Quiet Time up in the air—reading his Bible and silently praying. Inevitably, we got talking about spiritual things and discovered that we both knew John. Mr Ndabambi said to me, “I am John’s boss on paper, but in reality he is the more experienced man and so I rely on his counsel very much. He is the most experienced General Manager we have in the region. He joined the company in the 1970s and has risen through the ranks. When the Zambian economy was on the downswing, John managed to keep Chloride Zambia afloat by making very strategic decisions. He is also a very strong Christian. 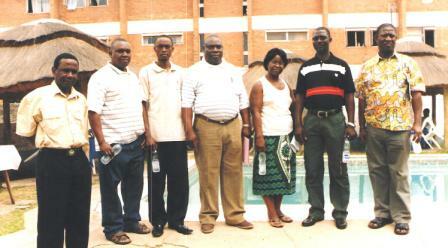 And so whenever I come to Zambia we have some very good times of fellowship together. It is good to have men like that when you visit a foreign country. It safeguards your soul.” He essentially repeated this same testimony at the funeral service. This was a very good testimony, speaking of an outstanding Christian businessman! Our dear brother John came to know the Lord in 1988 through the ministry of Riverside Chapel. Prior to this, he was fairly faithful in bringing his wife to church but he was not yet a believer. 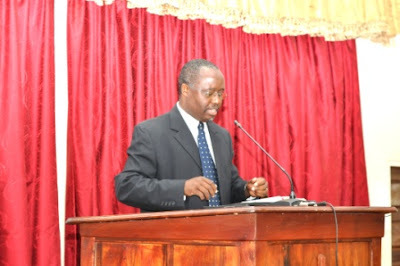 However, in 1988, after a road traffic accident, he realised his need of a Saviour and he committed his life to Christ. Brothers Valentine Mwila and Andrew Muwowo clearly remember going to visit him after the accident and his wife saying to them, “He has now given his life to Christ and now he is safe to go. Previously he was not ready.” Yes, he has been safe to go since then and he has now ridden on, on that glory train whose master is the Lord Jesus. Since his conversion, John never turned back, but served the Lord that he loved so dearly. He served on the church deaconate for a number of years. 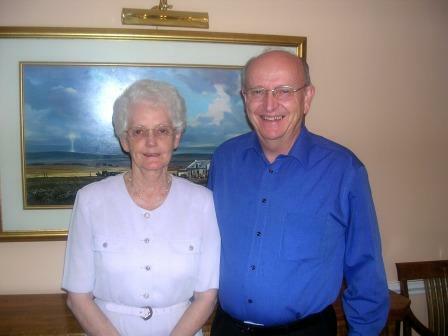 On the 25th of September 2005 he joined the church eldership. 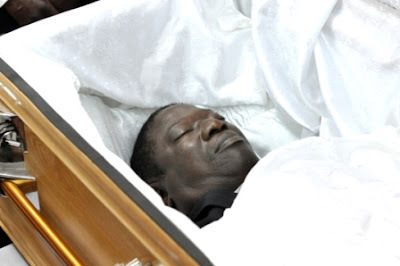 He remained faithfully serving in this position until he was taken to glory on Friday 24th September 2010. On the eldership, John was overseeing the following ministries: The Doctrinal Class, the Married Couples’ Ministry, the Men’s Ministry, and the Inter-Church projects. He was also the secretary of the eldership, a duty he carried out so well. We know that with his departure we are now truly crippled in this area. [At this point, Emmanuel went into a little more detail narrating John’s very short illness and hence sudden and surprising home call, after which he ended by saying...] John, our brother, we bid you farewell and we thank God for the life he allowed you to share with us. Good night, brother. Soon we shall say to each other, 'Good morning'. Farewell, beloved!" John Musonda’s testimony reminds me of a fact of life stated in the book of Proverbs (and quoted above): “The path of the righteous is like the light of dawn, which shines brighter and brighter until full day” (Proverbs 4:18). Yes, from the day of his conversion, John’s life shone brighter and brighter until God called him to glory. There, in the presence of God, he now shines brighter than the sun!